Dennis R. Beresford is Executive in Residence at the J. M. Tull School of Accounting, Terry College of Business, University of Georgia. From July 1997 through June 2013 he was Ernst & Young Executive Professor of Accounting. From January 1987 through June 1997 he was chairman of the Financial Accounting Standards Board. Previously, he was national director of accounting standards for Ernst & Young. He is a graduate of the University of Southern California. Denny previously served on the boards of National Service Industries, Inc., WorldCom (MCI), Inc., Kimberly-Clark Corporation, Fannie Mae, and Legg Mason, Inc. He is also a member of the board of directors of the National Association of Corporate Directors and the Financial Reporting Committee of the Institute of Management Accountants. In 1995, Denny was awarded an honorary Doctor of Humane Letters degree from DePaul University. 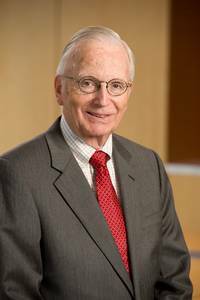 In 2004 he was elected to the Accounting Hall of Fame and received the AICPA Gold Medal for distinguished service. In 2006 he was selected as one of the inaugural inductees of Financial Executives Internationales Hall of Fame. In 2012 the Journal of Accountancy named him as one of the "125 people of impact in accounting" as among those who have had the most impact on the accounting profession since the AICPA was founded in 1887. In 2013 he received the Institute of Management Accountants first Distinguished Member Award.